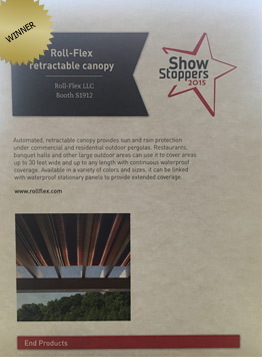 Roll-Flex® retractable canopies are proudly constructed with specialty awning fabrics designed to withstand the elements - harsh sun, rain and wind, yet look amazing season after season. Whatever size your space is, we've got you covered. An unlimited number of units can be linked together in tandem to cover large areas. Each canopy operates independently. This is ideal for large outdoor dining spaces where some customers enjoy sun and others want shade. Individual Roll-Flex® retractable canopies are up to 16 feet wide and can extend up to 28 feet long. BOLD STRIPES AND BRILLIANT COLORS MAKE A BEAUTIFUL STATEMENT. OUR RETRACTABLE CANOPIES CAN PROVIDE SHADE FOR YOUR DECK, PATIO, OR AROUND YOUR POOL AND PROVIDES THE ATMOSPHERE YOU'LL NEED FOR ENTERTAINING IN ALL KINDS OF WEATHER. THERE ARE MANY OPTIONS TO COORDINATE WITH THE COLOR SCHEME OF YOUR HOME OR BUSINESS.